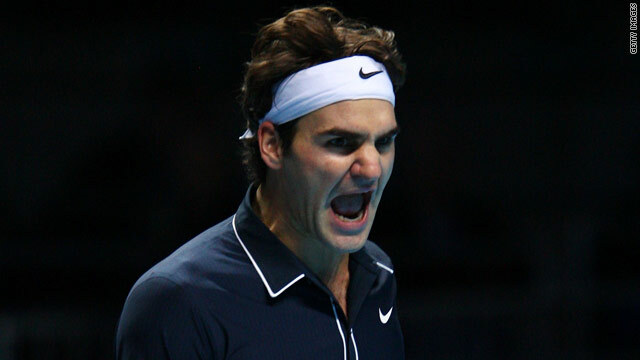 Roger Federer was at his imperious best as he cruised into the third round of the Australian Open in Melbourne. (CNN) -- Top seed Roger Federer sent out an ominous warning to his rivals with the most comfortable of Australian Open second-round victories over Victor Hanescu on Thursday. The Swiss maestro needed only an hour and 39 minutes to overcome the 47th-ranked Romanian 6-2 6-3 6-2 under the Rod Laver Arena lights. It was a convincing performance at the end of a day on which just one seed fell out of the men's draw -- with 2006 finalist Marcos Baghdatis coming from two sets down to beat 17th seed David Ferrer 4-6 3-6 7-6 6-3 6-1. Third seed Novak Djokovic, the in-form Nikolay Davydenko, 2008 finalist Jo-Wilfried Tsonga and last year's semifinalist Fernando Verdasco all progressed as the reputation for surprises at the season-opening grand slam continued to be undermined. Eighth seed Robin Soderling remains the only player inside the top 12 to have been eliminated after he lost in the opening round. Djokovic, the 2008 winner, overcame a poor start to defeat Switzerland's Marco Chiudinelli 3-6 6-1 6-1 6-3 and will play Uzbek qualifier Denis Istomin next. Meanwhile, Russian Davydenko proved why he has been considered as a contender to win his first grand slam title as he swept past Illyan Marchenko 6-3 6-3 6-0. The 28-year-old is arguably the form player on tour after his success at the ATP World Tour Finals last November and in Doha to start the year -- where he beat both Federer and Rafael Nadal. Baghdatis continued his hot streak in Australia to dump Ferrer out in an enthralling match that lasted four hours and nine minutes on Hisense Arena. The Cypriot is now on a seven-match winning streak after winning in Sydney last week and will next play local hope Lleyton Hewitt, which will evoke memories of their epic five-set match two years ago when the Australian edged to victory at 4.30am. Hewitt, the 22nd seed, won through by beating American Daniel Young 7-6 6-4 6-1, while 10th seed Tsonga only needed three sets to beat Taylor Dent 6-4 6-3 6-3. Verdasco raced through his night match with Ivan Sergeyev 6-1 6-2 6-2 and 30th seed Juan Monaco came from two sets behind to edge past Frenchman Michael Llodra 3-6 3-6 7-6 6-1 6-3. Tommy Haas, the 18th seed, was also taken the full distance by Serb Janko Tipsarevic before prevailing 4-6 6-4 6-3 1-6 6-3 in three hours and 20 minutes. Others seeds to progress were Mikhail Youzhny (20) and Nicolas Almagro (26) and Albert Montanes (31).